Dental cavities are often caused by a bacterial infection. Bacteria that are present in the mouth act on the food particle leftovers and convert them to corrosive substances, which abrade teeth. A dental cavity is damage that occurs to the structural integrity of the teeth. The condition can progressively deteriorate and cause a tooth loss. This common disorder that mostly affects children and young adults is also known as dental caries, or tooth decay. It is often accompanied by tooth sensitivity (toothache) and pain, especially while eating or drinking foods that are hot or cold. Visible brown spots may also be observed on the decayed tooth. Dental cavities are often caused by a bacterial infection. Bacteria that are present in the mouth act on the food particle leftovers and convert them to corrosive substances, which abrade teeth. According to National Institute of Dental and Craniofacial Research, the regular consumption of food solids and drinks (sugars and starch) expose teeth to acids, which eat away the tooth enamel, resulting in decay. An early sign of this decay is a clear white spot that appears on the tooth, indicating a loss of minerals. Further damage may be easily prevented and the process reversed if the condition is diagnosed at this stage. In order to maintain good oral hygiene, regular brushing and flossing of teeth (at least twice daily) is recommended by most dentists. 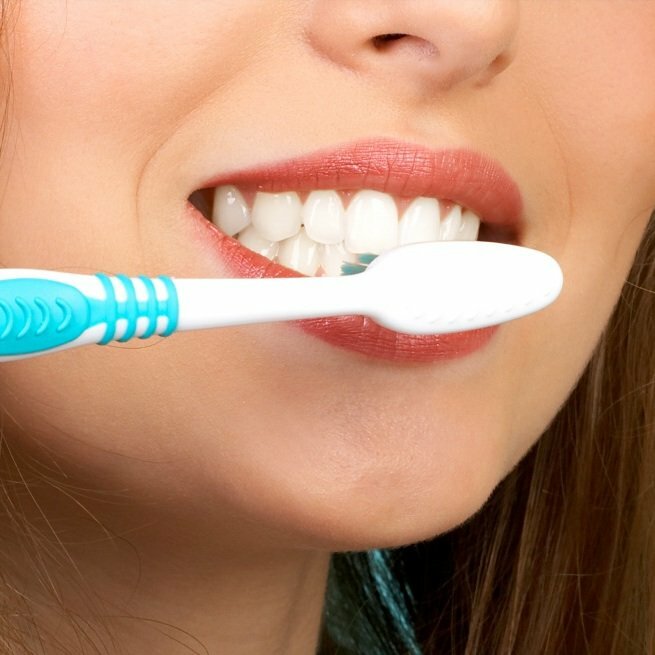 The National Health Service England advises to provide a minumum gap of one hour between eating and brushing the teeth to help saliva neutralize the acids formed in the mouth during eating. Fluoride products (like toothpaste, mouthwash, and fluoride dental gels) and even fluoridated water can help mitigate the damage caused by bacteria in the mouth. Fluoride can also help reduce the loss of minerals from the enamel and even replace some of the lost minerals in the teeth. The regular intake of food and drinks, such as sweets, candies, carbonated drinks, cakes, doughnuts, ice cream, and fruit juices that contain starch and sugar in high quantities, has to be avoided. Dental sealants, which are protective plastic coatings applied on the teeth, are particularly useful in children and teenagers. These sealants can prevent tooth decay by protecting the many grooves and valleys in between teeth, where food particles settle and are consumed by oral bacteria. Periodic visits to the dentist can help detect early dental issues, such as tooth cavities and decay, and help avoid or prevent complications that can result in tooth loss or even worse problems. A professional oral cleaning is recommended every six months or as advised by a dentist. Fejerskov, O. (2004). Changing paradigms in concepts on dental caries: consequences for oral health care. Caries research, 38(3), 182-191. Adachi, M., Ishihara, K., Abe, S., & Okuda, K. (2007). Professional oral health care by dental hygienists reduced respiratory infections in elderly persons requiring nursing care. International journal of dental hygiene, 5(2), 69-74. Peters, M. C., & McLean, M. E. (2001). Minimally Invasive Operative Care: I. Minimal Intervention and Concepts for Minimally Invasive Cavity Preparations. Journal of Adhesive Dentistry, 3(1). Moynihan, P., & Petersen, P. E. (2004). Diet, nutrition and the prevention of dental diseases. Public health nutrition, 7(1a), 201-226.